ADI engineers are trained to work as efficiently and as effectively as possible when finding the source of your gas leak. 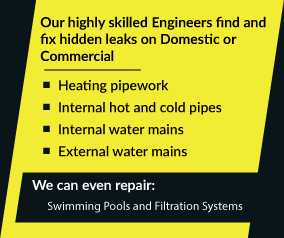 Regardless of where the leak might be on your property our engineers can track it down. You’ll also notice that we do our best to cause the minimum amount of disruption to your home or business life plus we also offer extremely competitive pricing for the high standard of work that we do. ADI are happy to serve customers all over the United Kingdom too of course. So why not call ADI now to discuss how we can help you – 08007313843.